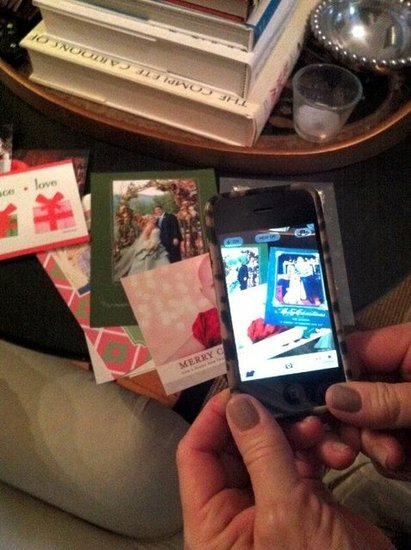 What do you do with all of the Christmas and Holiday cards you receive? Toss or keep them? Maybe you hate clutter and throw them away or just put them in a box and store them up in the attic, never to pull them out again. 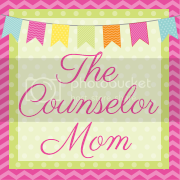 I don't know about you, but ever since I had kids I've become a sucker for keeping ALL of their mementoes. Their daily progress reports, artwork, birthday invitations, thank yous, you get the idea. But I'm learning to purge some. I am slowly trying to weed through the artwork and toss the ones that were really done more by the teacher. And at this time of year, it's hard to decide on what to do with all of the precious photo Christmas Cards we get in the mail. So far I am the one who throws them in a box and board them up. BUT today is your lucky day, I have done some online research and found some great ideas! Get ready to read on for some inspiration. 1. 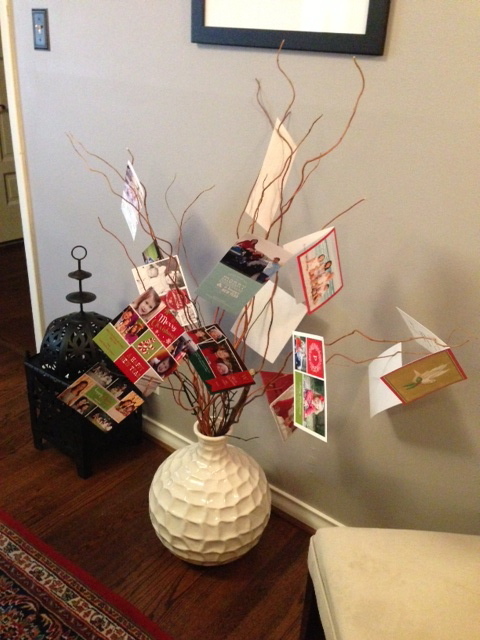 Card Tree: First I came up with a little tree to display them during the holiday season. It may be a little crazy looking, but I love it! I used tape but you can also stick string on them and hang them like ornaments. And I love watching my daughter open new cards and getting all excited to put them on the tree. Just get a few branches or get a cute miniature Christmas tree to stick them on. 2. 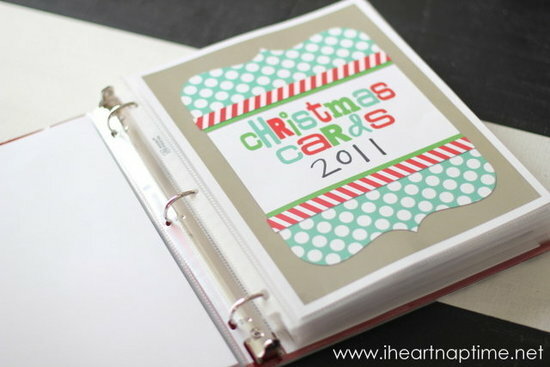 Card book: This is kind of a scrapbooky idea that I got from the blog eighteen25. 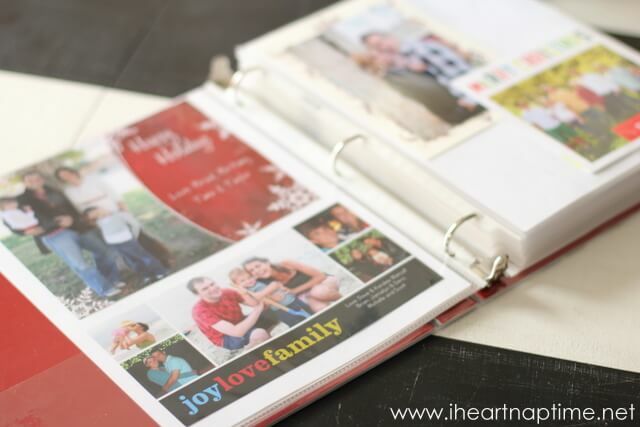 After the holidays, you can make them into a card book each year. Click here for the DIY instructions. Super cute idea! 3. Binder Book: I LOVE this binder idea from iheartnaptime.net. Just get a 3-ring binder with the page protectors, and put each card in it's own sleeve. A lot of cards now have pictures on the back and that way you can see both sides. It's a great way to store the cards and get them out each year to see how families change and grow through the years. 4. Phone Contacts: Store the card in your phone as your contact's photo! Just take a picture of the card and save it as that family contact. Some great ideas! What do you do with your cards?? Would love to hear your ideas. In the past I have made a big bow with 4 streamers/tails off of it. Then I staple the cards to the tails. I hang this on the wall where a picture usually is because it gets pretty heavy and needs a nail. But I'm sure you could use those adhesive hooks. This year I am doing similar but different. I ran ribbon on my kitchen cabinets, up & down. Fastened them with staples on the backside of the doors. I am then stapling cards to it. I like it better because it is a little cleaner look and makes my kitchen festive. Love the binder idea, I am going to start that this year for sure.